This store is the oldest business firm in Anderson. It has been owned and operated consistently by the same family for 175 years. Established by George W. Fant and originally named G.W. Fant & Son the store is an outgrowth of Dr. Edmund Webb's Drug and Book store, one of Anderson's first business establishments. Prior to 1851 Mr. Fant was associated with the Webb firm and assisted in conducting the business of the Post Office which was located in the store on the west side of the square. The book store later was moved to West Whitner Street. Presently it is owned and operated by 4th and 5th generation Fant descendants. Location. 34° 30.233′ N, 82° 39′ W. Marker is in Anderson, South Carolina, in Anderson County. Marker is on North Main Street, on the left when traveling south. Touch for map. Marker is located on the west side of the building, facing Main Street. 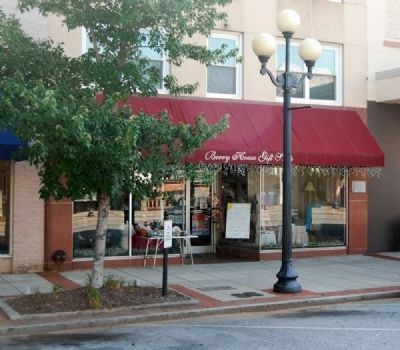 Marker is at or near this postal address: 126 North Main Street, Greenville SC 29601, United States of America. Touch for directions. (within shouting distance of this marker); Anderson: "The Electric City" (within shouting distance of this marker); William Church Whitner (within shouting distance of this marker); Anderson County Court House -- 1898 (within shouting distance of this marker); Anderson County Confederate Monument (about 300 feet away, measured in a direct line); The Four Way Test (about 300 feet away); Anderson County Law Enforcement Officers Memorial (about 300 feet away); Portman Shoals (about 400 feet away); Portman Dam and Power Plant (about 400 feet away); G.F. Tolly Building -- c. 1910 (about 400 feet away). Touch for a list and map of all markers in Anderson. 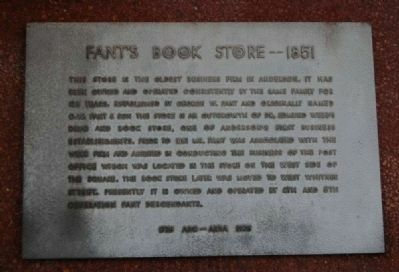 Regarding Fant's Book Store -- 1851. Fant's Book Store is no longer in operation. The building shown has contained the Berry House Gift Shop and Johnny Angels, a bar (present). From left to right: Charles Langston, George W. Fant, Will Webb, and Rufus and Theo Fant. The bookstore later moved to 209 West Whitner Street by 1890 before moving to North Main Street, its final home. In 1829 there was born in the Calhoun settlement a baby boy who was destined to play a part in the history of the little town which had been started in the woods the year before he was born. He was George W. Fant, eldest son of William Fant. In his childhood his parents moved to Garvin township, near Pendleton, where he grew up. At about twenty years of age he located in Anderson and worked on the Gazette when Todd and Russell were its publishers. In 1856 Mr. Fant was appointed postmaster, which position he held until 1880. He married Miss Myra Williams ton, and T. J. Webb married her sister Elizabeth. Mr. Webb was postmaster and also book seller, and his business passed first into the hands of his son, T. J. Webb, and from him to his brother-in-law, G. W. Fant. — Submitted July 31, 2009, by Brian Scott of Anderson, South Carolina. 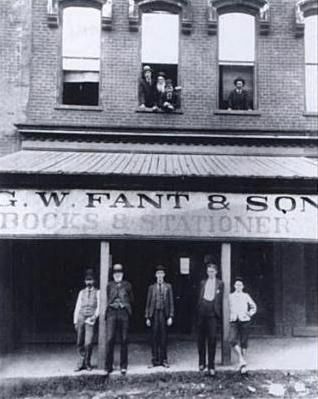 Rufus and his brother Theo were the second generation to own and operate Fant's Book Store. Buried at Old Silver Brook Cemetery, Rufus Fant's tombstone faces a grove of bamboo. The grove was started at the Old Silverbrook Cemetery in 1893 by Rufus Fant and has never flowered. It is the only edible grove of bamboo in the United States. More. Search the internet for Fant's Book Store -- 1851. Credits. This page was last revised on June 16, 2016. This page originally submitted on July 31, 2009, by Brian Scott of Anderson, South Carolina. This page has been viewed 1,702 times since then and 16 times this year. Photos: 1, 2, 3. submitted on July 31, 2009, by Brian Scott of Anderson, South Carolina.